Photography enthusiasts will be delighted by the latest attraction in George Town’s historic quarter, the Penang Camera Museum, which opened only last October 2013. Housed in a restored pre-war shophouse, the museum traces three centuries of the development of the camera. 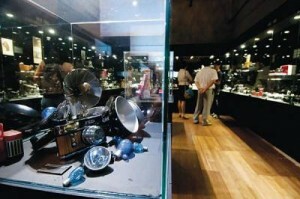 Touted as “the first camera museum in Southeast Asia”, there are over 300 cameras on display. Among the cameras in the collection are daguerreotype, box camera, folding camera, large and medium format camera, 35mm camera, single and twin lens reflex, point and shoot, instant camera and digital camera. The cameras on display come from all over world including Britain, Europe, France, India, Japan Russia and Thailand. A few cameras on display can actually be held and manipulated by visitors to give them a feel of how these antiques work. There’s also a mock dark room where tour guides explain how film is developed, and photographs are processed. But, in my opinion, the most fascinating feature is the room-sized camera obscura that visitors can actually walk into, which demonstrates the fundamentals of photography. After exploring the museum, one can drop by the Double Exposure café to rest and relax (Check out the camera cupcakes!) Or perhaps peruse some cool souvenirs at the gift shop on the ground level. This blog post was made possible through Visit Malaysia Year 2014 Countdown Carnival, a media tour held last December 27 to 29, 2013 in Penang. The event was organized by Gaya Travel Magazine and Tourism Malaysia in celebration of Visit Malaysia Year 2014. I went there last Saturday and enjoyed looking at the ancestors of Camera. It was a nice experience.